Many of us associate varicose veins with unattractive nods bulging on the shins. However, in addition to aesthetic problems, varicose veins can lead to very serious complications, including difficulty in movement / impaired motor function. According to statistics, approximately 10% of men and about 30% of women around the world seek medical help with this ailment. That is why, it is advisable to know first and often subtle symptoms of developing varicose veins. Timely detection of the disease and medical intervention will help you avoid unpleasant consequences. So, for your attention 6 subtle symptoms of varicose veins. If you regularly feel your feet getting numb for short periods of time, this may indicate an early stage of varicose veins in your legs. If it occurs rarely, don’t worry – only a recurring symptom is a sign of varicose veins. Numbness (paresthesia) - a short-term loss of skin sensitivity. With varicose veins of the lower limbs, this symptom can be associated with a violation of trophic processes in this area. Experts are strongly against ignoring numbness and tingling and advise to seek medical help in case of persistent symptoms. 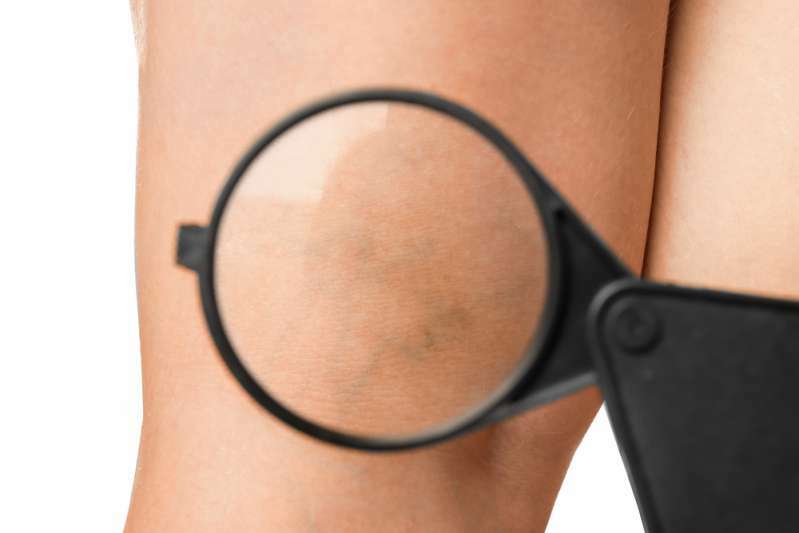 Very often, the discoloration of leg skin in the affected areas occurs in varicose veins patients. Uneven shade, light, or dark spots shouldn’t be ignored. Changes in the color of the skin are caused by poor circulation of lymph and insufficient blood supply. At first, the spots won’t cause you any discomfort, but as the disease progresses, they become denser, redden, and cause itching. Without proper treatment, it’s possible to develop inflammation and trophic ulcers. Often, leg swelling is a precursor of varicose veins. It is caused by the retention of fluid in the intercellular space, which occurs when the venous valves fail. Usually, swelling happens in the evening and gets worse in hot weather. According to statistics, varicose veins mostly affect women. To objectively establish this symptom, doctors advise to measure the ankle circumference. If in the evening the circumference increases by 0.4 inch or more in comparison with the morning, it's time to sound an alarm. This symptom is one of the most neglected subtle signs of varicose leg disease. Itching in the ankles and legs is caused by changes occurring in the tissues and vessels adjacent to the affected area. Stagnation of blood in the veins leads to tissues microcirculation disorders, retaining metabolic products in cell structures. This process is the reason of exfoliation and excessive dryness of the leg skin. Itching due to varicose veins may seem a fairly "innocent" symptom, but it is in fact the earliest sign that signals the onset of the disease. In addition, ignoring it over time can also lead to the trophic ulcers. Night cramps in the legs - one of the most famous symptoms of varicose veins in legs. Stagnation of blood leads to disruption of circulation in veins and smaller blood vessels. This serves to increase the pressure on adjacent tissues, irritating the nerve endings and, in the end, making muscles cramp. In addition, because of poor metabolism, muscles begin to suffer from oxygen starvation, which also leads to spasms in limbs. If after a prolonged period of remaining static and no muscular contractions you begin to feel pain in your legs, this is a reason to turn to a specialist. At the early stages of varicose veins, the pain is insignificant and is relieved by gentle massage or lifting the legs in sitting and lying position. However, this symptom is considered fairly disturbing. Unpleasant sensations and pain in the limbs are caused by violation of blood circulation, impeding the blood outflow from the lower extremities to the heart. Along with varicose veins, phlebologists recommend to examine the cardiovascular system too, which will help avoid more serious problems. Drink at least half a gallon of fluid per day. With dehydration, the blood gets thicker overworking the veins. Lead an active lifestyle. Correct blood circulation directly depends on physical exertion. The best activities to prevent varicose veins are walking, yoga, jogging, and pilates. Buy underwear of compression garments. It is considered the easiest way to prevent varicose veins in legs. With regular use, compression lingerie prevents the swelling and the appearance of vascular asterisks. Long-term air travel increases the risk of blood stagnation and the development of deep vein thrombosis. To prevent blood circulation disorders during the flight, take off the shoes, drink water, and don’t wear tight clothes. Sit properly. Crossed legs prevent normal blood circulation. As already mentioned above, timely detection and treatment of varicose veins will help prevent serious complications. Therefore, as soon as you discover any of symptoms above we strongly recommend that you set a doctor’s appointment.